For nine years between (1999 to 2008), taking Azathioprine (Imuran) in varying doses between 150mg to 200mg/day successfully kept surgery at bay. Any Crohn’s flare-ups were dealt with by short courses of steroids. Then a series of routine blood tests showed that my platelets were dropping and it was concluded that Azathioprine was the most likely cause. I stopped taking it and within 2 years was undergoing major surgery. 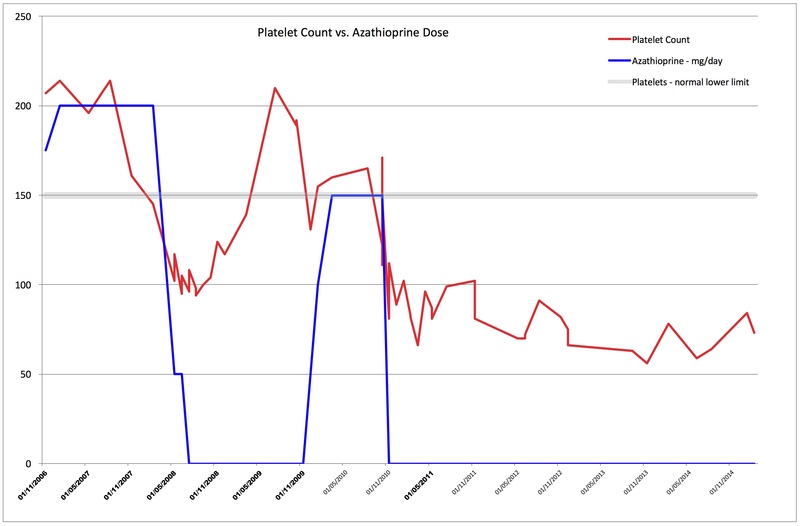 I drew a graph to try and spot any correalation between the drug dose and the platelet count. I was expecting to see the count bounce back once I stopped taking Azathioprine and it did so the first time but when I started/stopped for the second time the platelets remained low. I’m guessing at that point the bone marrow was already damages. The only way to investigate further was to have a bone marrow biopsy. decreased production – the body isn’t producing the right number in the first place which could be down to bone marrow failure. We also discussed another factor – the implication of my enlarged spleen. Enlarged spleens can hold increased numbers of platelets and therefore the number released into the bloodstream is lower hence the lower count. I replied asking for an indication of what they had found. The response was that it would be easier to discuss the findings in clinic. She was not completely happy with this MDS conclusion because a bone marrow biopsy looks at two substances – the marrow itself and the aspirate (fluid). When the procedure was carried out the doctor was unable to obtain good aspirate slides as the blood in the samples kept clotting. After several attempts, but with little success, they had decided to concentrate on obtaining a good bone marrow core. She described it as “like having a three piece jigsaw from which two of the pieces are missing.” At the next MDM they had discussed the results again and decided that, in my case, it was unlikely to be MDS but would recommend a further biopsy to get useable aspirate samples. “How would you feel about this?” I replied that I really wasn’t fussed. If it would help narrow down the diagnosis then the sooner the better. Next time they would use heparin, a blood thinner, with the sample needle as it should prevent the blood from clotting. If the diagnosis wasn’t MDS then why the low platelets? The most likely cause was a combination of long-term Crohn’s and taking azathioprine. The biopsy had shown that the marrow was under-producing platelets rather than being over active and eating them up. I had been unaware that there was a potential link between Crohn’s and bone marrow. The MDM had then gone on to discuss what the implications for treatment would be if it was/was not MDS. In either case the preferred course for treatment, at this stage, would be “do nothing” unless I was to have any procedures that could cause bleeding or that required surgery. A supply of platelets should be made available if either of these were needed. The difference in approaches would be in the monitoring regimes and we would discuss this further after the next biopsy results were available. Back to reception to book up another biopsy and a three-month follow-up appointment. In the meantime I had a routine gastroenterology appointment and I mentioned the need for a second bone marrow biopsy. Now you would think that a doctor who doesn’t bat an eyelid when sticking a camera up a patient would be pretty much hardened to all medical procedures, but the mere mention of the bone marrow biopsy was enough to make him squirm. He asked me if I was OK having the biopsy as it was the one test he really wouldn’t want to undergo himself! Strangely enough he wasn’t the first person to express that emotion. A couple of weeks after the second biopsy I was back to see Haematology. When I went in for the pre-appointment blood test the phlebotomist asked me if I knew why she was also taking an “histological” sample. Since I didn’t know what “histological” meant I was of little help. (Of course I know now! It’s the anatomical study of the microscopic structure of animal and plant tissues). The haematologist explained that one of the biopsy samples, which should have gone for histological testing, had either been mislaid or mislabelled so did not make it. This is why she had rung me a few weeks back to explain the situation. I’d forgotten about this. She had, however, looked at the other slides from that second biopsy and these were fine. The missing sample had been discussed with the chief histologist and he suggested doing a specific type of blood test which had proved to be 60% effective in spotting problems, if there were any. The results would be available in a week’s time. The alternative was to have a third bone marrow biopsy but they didn’t want to put me through that again. I suppose I could have made a fuss about the missing slide but I couldn’t see what good it would do. When I saw the haematologist in February 2015 she described my bone marrow as being “a four cylinder engine running on only three” and therefore not delivering the right quantities of platelets. What is the long-term prognosis for the thrombocytopenia? It should not affect the other issues I have – Crohn’s, potential PSC, PVT, but I must avoid the use of azathioprine in the future. It’s important not to get hung up on the numbers as I am asymptomatic and do not bleed profusely if I cut myself. What could have caused the low platelets? There are no signs of marrow abnormalities that could point to a more sinister conclusion (leukaemia), therefore the cause is most likely to be drug-induced long-term use of azathioprine. The official description was “asympomatic thrombocytopenia. Therapy related secondary dysplasia on bone marrow morphology – most likely due to Azathioprine”. Do I need treatment? No, but must look out for any signs of starting to bleed more easily. Monitoring? Six-monthly blood tests and outpatient appointments (which subsequently became annual and then dischargeded). Previous PostMedical RecordsNext PostElective or Emergency?